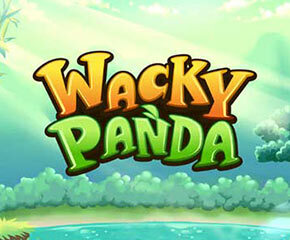 Wacky Panda is a video slot game from the house of Microgaming. This online slot has cute animals with the genre of oriental and if one likes to play classic-natured games, then this slot is definitely worth checking out. This slot is very easily accessible for playing on all the types of the Android devices, laptops, desktops, PCs and tablet devices and it provides a nice Return To Player Percentage of 96.00%. Take a closer look into Wacky Panda! 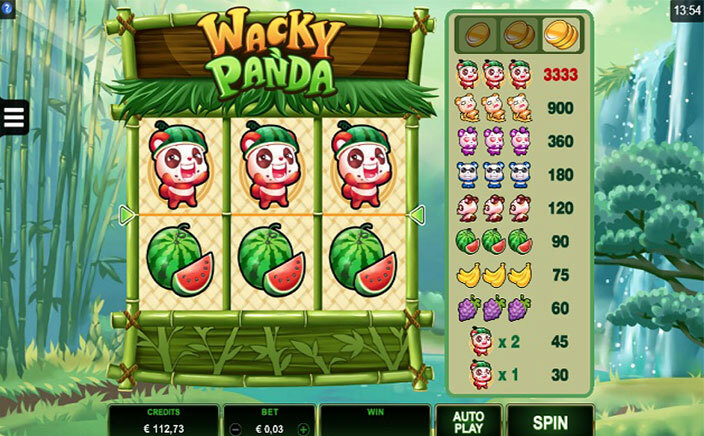 Wacky Panda slot is presented over three reels and three rows. It has just one payline for the win that means it is harking back to the time of simpler games but will definitely provide generous payouts to the players. The slot gives a chance to set a min bet value and a max bet value that ranges between £0.01 a spin to a £15.00 a spin respectively. The three reels of Wacky Panda spin in a bamboo frame and is accompanied with a beautiful background of a pool fed by a waterfall and surrounded with plants all around. All paytable information required by you is available on right-hand side. The slot symbols has pandas that can be differentiated on the basis of colour ( red, purple, yellow, brown and blue), a bunch of bananas, grapes, and watermelons. All that which is left now in the game is to spin the reels as the game neither has any extra features nor any wild symbols. You just need to pick up the stake and has to press the ‘Spin’. It is worth to note here that there are 3 coin levels available in this slot from which you will have to select. It is only at the highest coin level that a massive payout of 3333x is won by the player which has a statistical advantage over 1 and 2 coin levels. Wacky Panda slot is very high-quality game which has anime feel, some cutesy graphics and has a soothing Chinese music which plays throughout the gameplay. The slot is very colourful and kind of zany. The slot comes with low to moderate volatility.